SCHEDULE YOUR FREE TELEPHONE CONSULTATION"Se Habla Español"
Attorney Mary E. Gaiser was born in Scarsdale, New York, and moved to Spring Hill, Florida when she was ten years old. After graduating from F.W. Springstead High School, she attended the University of South Florida in Tampa where she received two Bachelor’s Degrees in English and History. Attorney Gaiser’s interest in practicing law has been a life-long dream since she was seven years old. Her dream led her to the University of New Hampshire School of Law in Fall of 2013. While in law school, Attorney Gaiser realized her passion for litigation. In her second year of law school, she competed in the Cardozo/BMI Copyright and Entertainment Law National Moot Court competition in New York City, and was hired as an intern for the Merrimack County Attorney’s Office where she spent every day in the courtroom representing the State of New Hampshire. In her third year of law school, Attorney Gaiser coached another moot court team for the Widener Law Corporate Law Moot Court competition in Wilmington, DE. In addition to finding her passion for litigation, Attorney Gaiser also found her passion for helping people in need. In her third year of law school, she became the first University of New Hampshire School of Law student to ever be selected for admission for the New York Pro Bono Scholars Program. This program granted Attorney Gaiser the ability to sit for the New York and New Hampshire bar examination prior to graduating law school. Upon completion of the exam, Attorney Gaiser began a full-time internship with New Hampshire Legal Assistance, where she represented low-income clients on a variety of housing and benefit issues. Attorney Gaiser found this work rewarding in many ways, as she was using her legal skills to help those who, without aide, would have their lives dramatically changed. 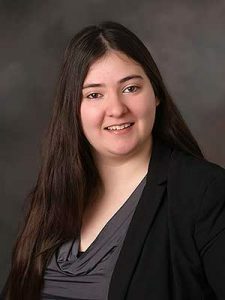 Upon finishing her internship with NHLA and graduating law school, Attorney Gaiser completed the NYPBS program and was granted admission to the New Hampshire and New York Bars. Upon her admission to the New Hampshire Bar, Attorney Gaiser began practicing as an associate attorney with a seacoast solo family law practitioner. Once Attorney Gaiser began working in family law, she became aware of the importance of using her legal skills to guide her clients through one of the most emotional and difficult times in their lives. Attorney Gaiser is dedicated to the practice of family law and has utilized much of her free time studying current trends and outcomes in New Hampshire Family Courts in order to ensure her legal representation provides accurate advice and concrete solutions to the variety of problems family law presents. Attorney Gaiser currently resides in Concord, New Hampshire. In her free time, she enjoys self-studying a variety of topics including science and mathematics, as well as spending time with her friends, and doing outdoor activities such as running and hiking. She brings a high level of passion and dedication to the practice of family law and enjoys working with clients to exceed their expectations while ensuring a smooth and comfortable transition to a new life for their families.